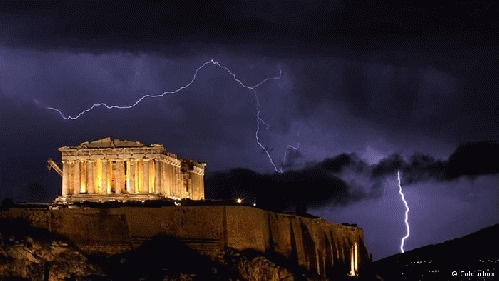 The crushing Greek debt could be canceled the way it was made -- by sleight of hand. But saving the Greek people and their economy is evidently not in the game plan of the Eurocrats. Greece's creditors have finally brought the country to its knees, forcing President Alexis Tsipras to agree to austerity and privatization measures more severe than those overwhelmingly rejected by popular vote a week earlier. No write-down of Greece's debt was included in the deal, although the IMF has warned that the current debt is unsustainable. Former Greek finance minister Yanis Varoufakis calls the deal "a new Versailles Treaty" and "the politics of humiliation." Greek defense minister Panos Kammenos calls it a "coup d'etat" done by "blackmailing the Greek prime minister with collapse of the banks and a complete haircut on deposits." "Blackmail" is not too strong a word. The European Central Bank has turned off its liquidity tap for Greece's banks, something all banks need, as explained earlier here. All banks are technically insolvent, lending money they don't have. They don't lend their deposits but create deposits when they make loans, as the Bank of England recently confirmed. When the depositors and borrowers come for their money at the same time, the bank must borrow from other banks; and if that liquidity runs dry, the bank turns to the central bank, the lender of last resort empowered to create money at will. Without the central bank's backstop, banks must steal from their depositors with "haircuts" or they will collapse. [T]he Greek people, the citizens of a sovereign country . . . have had the audacity to democratically elect a socialist government. Now they have to suffer. They do not conform to the self-imposed rules of the neoliberal empire of unrestricted globalized privatization of public services and public properties from which the elite is maximizing profits -- for themselves, of course. It is outright theft of public property. A Truth Committee convened by the Greek parliament reported in June that a major portion of the country's 320 billion debt is "illegal, illegitimate and odious" and should not be paid. The ECB has already embarked on this sort of debt purchasing program. In January, it announced it would purchase 60 billion euros of debt assets per month beginning in March, continuing to at least September 2016, for a total of 1.14 trillion of asset purchases. These assets are being purchased through "quantitative easing" -- expanding the monetary base simply with accounting entries on the ECB's books.